To Our New Managers: Welcome! We're extremely proud to announce that we've won a 2011 Addy Award for brand identity by the American Advertising Federation Memphis, in collaboration with Paradigm Marketing & Creative. The awards were announced Saturday, February 19th. This further establishes that our brand is truly unique. Our company competed in the "brand identity" category and we were judged based on creativity, originality, and creative strategy. Paradigm Marketing & Creative, also located in Memphis, helped us to develop a consistent and distinguishable brand that emphasizes outdoor elements (earth, air, fire, and water), associates regional trees, and ties each property back to the corporate identity. Although each resort has unique geographical qualities that make it distinct, there are common factors guests will find at every property. For example, each Outdoor Destination features RV sites and cottages which are fully equipped with free cable television and Wi-Fi. RVC also prides themselves on their thoughtful environmental design, superb amenities, and multiple outdoor activities. These characteristics, along with the means of how RVC portrays their properties, were the determining factors for the Addy Award. 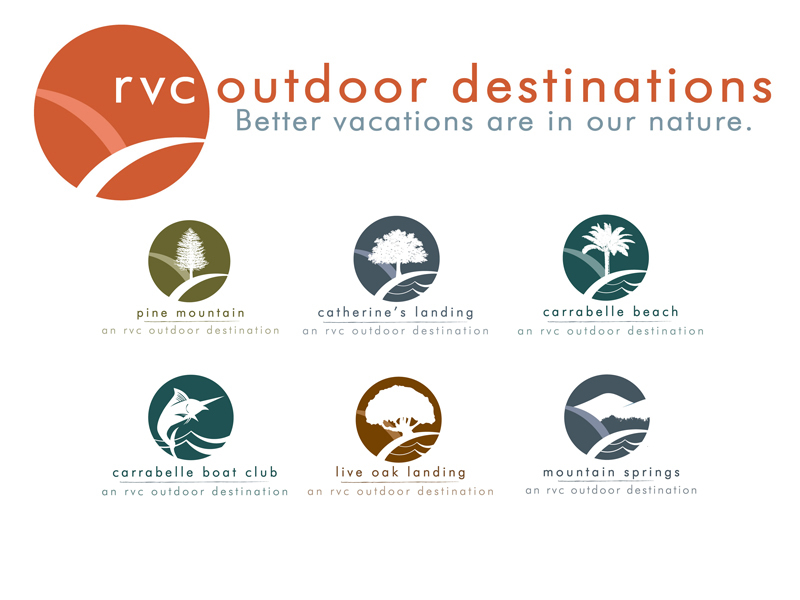 In conclusion, RVC presented a different, atypical class of resorts, which all tie together to a common theme of a superior outdoor vacation with the service of an upscale hotel. We welcome Neil Sorrell, Manager of Live Oak Landing in Freeport, FL to the team. Live Oak Landing opened in November of 2010 and the resort has just finished construction of additional enhancements. Sorrell has traveled the globe and was responsible for nearly $2,000,000 in sales with Outdoor Resorts of America in 2005. Jim Anderson, Manager of Pine Mountain, an RVC Outdoor Destination in GA, has been involved in the outdoor resort industry for over five years. He worked at an RV Park near Yellowstone National Park in Arizona, where he provided oversight of operations for over 300 sites. After that, he led a restructuring and successful turn-around effort at an RV park in Wyoming. Catherine’s Landing (AR) will be managed by Aundrea Crary and assistant manager Ian Horgan. Both have experience in the hospitality industry and Crary currently serves on the Hot Springs Chamber of Commerce board. “All of our General Managers, including Sheryl Mitchell, General Manager of our Carrabelle Beach, FL property, have deep experience in the travel and tourism fields,” explained Yale Spina, Vice President of Operations for RVC Outdoor Destinations. “I am proud to be working with such a strong group of professionals and it doesn’t hurt that they are also great people,” Spina added. Let's make this an exciting and prosperous year!